Last week, the Texas Federation of Republican Women (TFRW) took another bold step showing that the Texas Republicans want to lead the way on reasonable and sensible immigration reform laws. The time has come for our nation to address this problem and to do so in a way that respects the rule of law and addresses immigration as a means of economic growth and prosperity for our state and nation. The resolution, overwhelmingly passed by the members of the TFRW board, calls for implementation of a guest worker program similar in nature to "The Texas Solution" platform of the Republican Party of Texas. "Our goal was to arrive at a reasonable statement, one that actually had the opportunity to be implemented; one that would look at a complete solution for the entire issue. 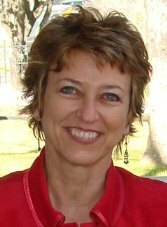 We wanted a policy statement that would encourage good legislation and serve as a deterrent for poor piecemeal legislation,” said TFRW President Carolyn Hodges of Houston. The resolution calls for securing the borders of the United States, establishing a legally legislated guest worker program and for establishing specific criteria under which young people brought to the U.S. illegally can earn a pathway to legal residency and eventual citizenship. The statement quickly drew praise from Texas Land Commissioner Jerry Patterson and many members of the Texas Legislature. "I am grateful to the TFRW and its leadership for taking a strong stand in favor of immigration reform," said Commissioner Patterson. "Their statement is a strong call to action to our federal lawmakers, and I could not be more pleased at the way in which President Carolyn Hodges and this organization have stepped up to help lead on the issue." State Representative Larry Gonzales (R-Round Rock) called the resolution, "Monumentally important!" on his Facebook page. For over a decade we have been unable to move the ball forward on finding a meaningful and sensible solution to our immigration problem. The result has been a virtual amnesty leaving millions of undocumented people in this country with no means of determining their identity and intent. A comment made on Facebook by John Paul Garcia said, "Reduced barriers to entry and clear path to gainful employment will reduce crime. Ignorance, crime, and poverty always feed each other. The immigrant is usually first to get blamed." I spoke with TFRW Secretary, Jan Ott about the resolution. She told me, "TFRW made it a priority early in 2012 to begin working on an Immigration reform policy statement. For nearly a year our TFRW committee met to study the issues and look for workable solutions for the United States immigration policy. There has been no legislation for almost 30 years regarding immigration reform and it is important for our security as well as economic and humanitarian reasons that we pass legislation that is workable and addresses all of these issues. The committee went through a thoughtful and thorough process to develop the TFRW policy statement that is being widely supported by not only our 10,000 member organization but also by elected officials across the state." Congratulations to the women of the TFRW. Their bold statement will provide the necessary political support for our Texas legislators and Members of Congress to allow them to step up to the proper role of Texans - Leadership! Resolved, The Texas Federation of Republican Women urges the federal government to expeditiously establish criteria for young people in this country illegally through no fault of their own to earn legal resident status or citizenship when they demonstrate English fluency and knowledge of American civics, comply with all health requirements, have no criminal record, graduate from an accredited high school, and pursue a college degree, trade certification or enter into military service. 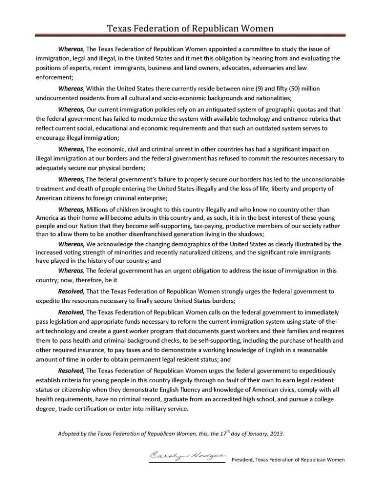 Adopted by the Texas Federation of Republican Women, this, the 17th day of January, 2013.